Increasingly, animal ambassadors are playing key roles in many aquariums and zoos. Presented by skilled staff to a variety of audiences, these animals introduce guests to the species' unique natural behaviors, the ecosystems where they evolved, and their conservation status. Because these animals are inherently interesting, they also create an ideal opportunity for the organization's key messages to be presented to guests. With the growing popularity of these types of presentations, many programs have organically evolved over time instead of benefiting from strategic planning. In recognition of this challenge, Nicki Boyd and Susie Ekard—who have over 50 years of experience between them managing animal ambassadors and animal training staff—have teamed up to author Animal Ambassador Management, the latest Academy course in the Animal Care Training professional series. Participants taking this course will understand best practices in the acquisition decision process, as well as the management and training of the staff and animals for these complex types of programs. 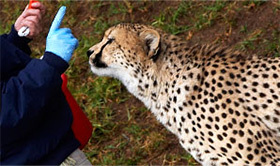 This course pays special attention to handling policy—particularly animal, trainer, and guest safety—and develops a better understanding of the welfare needs of each of the unique animal ambassadors. In the most effective programs, animal ambassador presentations are designed to present the organization's key messages, which support the institution's mission and conservation goals. As a component of the collection plan, each organization should have approved key messages that are presented at every guest interaction. The course explores what key messages are and how they are developed, as well as a sample of key messages that are currently in use. 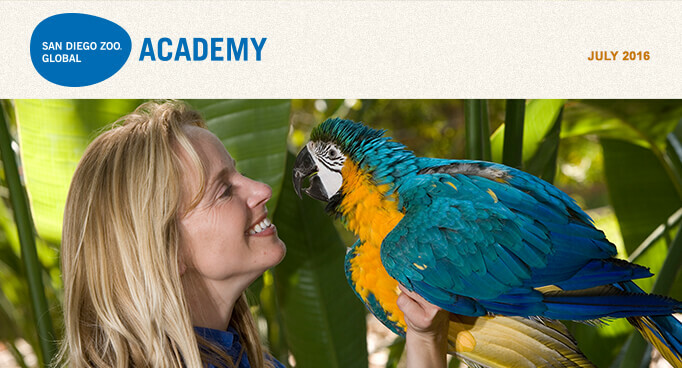 This course will be of value to anyone who manages an animal ambassador program or works with animal ambassadors, as well as to individuals who are responsible for the institution's overall messaging. If you have questions about this new course, please contact Gary Priest, gpriest@sandiegozoo.org. Mark your calendar: San Diego Zoo Global Academy is having an event—not virtual this time! The San Diego Zoo Global Academy will have a get-together on Saturday, September 10, 2016, from 7 to 9 p.m. Let's celebrate our industry collaboration around online training! In addition to a great locale with food and drinks, the evening will feature our Academy newsletter contributors Jim Gesualdi, Dr. Rob Jones, and San Diego Zoo Global's Chief Human Resources Officer Tim Mulligan. More details to come in upcoming newsletters! The Happy Hollow Park and Zoo in San Jose, California is part of the Academy's collaborative learning environment! 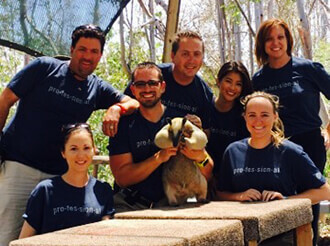 San Diego Zoo Safari Park's Safari Experiences team is wearing their Academy shirts! Now available from San Diego Zoo Global's online shopping portal, shopzoo.com: whether it's for you, a gift for someone else, or an incentive for your institution's training program, you can have your own Academy T-shirt! Please join us for the Administrator's Users Group Webinar, hosted by Academy partner CypherWorx on Wednesday, July 20, at 11 a.m. PDT. After registering, you will receive a confirmation email containing information about joining the webinar. In this course, participants will interpret OSHA's role and standards regarding electrical safety/hazards, define the basic fundamentals of electricity, identify and recognize safety hazards, describe protection methods against electrical hazards, and analyze case studies. "At this time, we heavily use all three interpretation courses. While the courses are not required initially for new staff members, because we train (with) a condensed version when they're first hired, all our tour guide classifications—walking tours, trams, photo caravans, and behind-the scenes tours, as well as animal presenters—are required to take the courses, typically within the first two or three months after hire. We have also made the modules optional for those who are not currently in an interpretive role, as a means of building their skill set, if they'd like to. It has been extremely useful to build common language and criteria for delivering our tours." If you would like additional information regarding use of these courses, please contact Tami Bankson, tbankson@sandiegozoo.org. The Ocelots are a volunteer group with a special interest in the San Diego Zoo. Each year, they pool their resources to fund a wide variety of collection-related purchases. 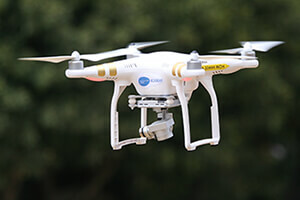 In 2016, the Academy received the happy news that the Ocelots had approved our grant request for the purchase of an Unmanned Aerial Vehicle (UAV), or drone. Almost before we got it out of the box, opportunities for using this new tool began to come into the Academy offices. The first was a request for aerial video footage of the threatened local coastal sage scrub habitat. The video would be used in a new Academy course being developed by the Institute for Conservation Research's Plant Conservation division. The footage obtained was visually stunning. We also heard from San Diego Zoo Global President and CEO Douglas G. Myers, who requested that we use the drone to photograph ongoing construction from the unique vantage points the drone could capture. In future newsletters, we plan to share video links to some of the interesting ways facilities might use this new technology. Click here to see drone footage that will be included in the upcoming Plant Conservation course. If you would like to explore uses for UAV-captured images, contact Gary Priest, curator of Animal Care Training, at gpriest@sandiegozoo.org. Disappointments and setbacks can stop us along a journey—sometimes ending it, possibly prematurely—point us in a new direction, or simply make us think, regroup, and carry on with a better approach. In our weaker moments, these seeming obstacles can weigh us down and, even worse, may lead us to blame circumstances, forces, or people outside of our control. While such a reaction is commonplace, skip that "emotional placebo" and get better. One of a few recent developments for me, professionally and personally, came about as the result of a (fortunately) very short-lived reaction that blocked constructive action. Being humbled, yet not crushed, and realizing the need for a better approach, I stumbled through, thinking, "I am simply not good enough." The thought, grounded in reality, was unsettling. It was also unproductive. Previous columns and Excellence Beyond Compliance® have posited: "I want to get better. I am committed to continuous improvement in all ways." There is always something I can do to be better, to make an even bigger difference, to serve more effectively. Some consistent practices assist in ongoing improvement efforts and compound to good effect, but the greatest growth and advances seem to flow from adversity and the inspiration it can bring. How fortunate I am to work with committed and compassionate people, dedicated to caring for and protecting the animals in zoological settings and in the wild. To contribute even in a modest way to animal well-being is life energy well spent. Mindful of the great blessing it is to be able to do such good, being in the presence of like-minded souls—or the animals themselves—inspires me to move ever upward. Excelsior, indeed! Adversity and challenges, viewed constructively, do not need to be burdens added to our already overwhelming responsibilities. Taking ownership of situations, even in the face of being held accountable, empowers us to be better. Whatever the situation, or however daunting the challenge, we can start—here and now—to make the matters before us, and ourselves, better. The bigger the challenge, the greater the opportunity exists for improvement and transformation. After all, it is about "Getting Better All the Time," particularly with respect to ongoing enhancements in animal welfare and professional development. Study your challenges and those before the zoological community. Lift yourself and others, including animals, and keep going. This month, we will look at chlorine and chloramines, which are frequently added to water as disinfectants, but which can negatively impact many aquatic animals. Chlorine is also frequently used for sterilizing purposes, so it is important to understand the chemistry involved. Gas chlorination of drinking water thus lowers the pH and acidifies the water, due to the production of hydrogen ions (H+). These reactions, again, depend on the pH level. Next month, we will look at problems chlorine and chloramines cause for our aquatic animals.